On Fiction Addiction, literary agent Jeff Kleinman offers a few ways to protect your plot ideas. I have nothing against copyright registration (although it is unnecessary for novelists), but I wouldn’t recommend getting hung up on fears that someone is going to steal your ideas. Most novels excel based on their execution rather than their original content. An extraordinarily well-written story will stand out even if its premise is time-worn. For example, His Majesty’s Dragon has a premise very similar to Harry Turtledove’s Into the Darkness. 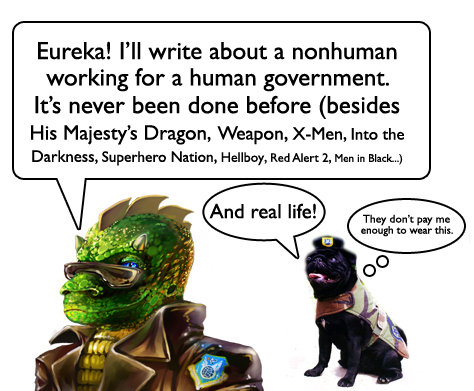 (Humans use dragons to fight Napoleon or a thinly-veiled fantasy Hitler, respectively). HMD is drastically better, not because its plot is original but because its characters are far better-executed and its writing is snappier. If someone writes a book with a premise similar to yours– and that will almost assuredly happen to superhero writers– you will probably have to compete with them for readers by demonstrating superior style and execution.